This dense hedge of wild roses is no longer along the perimeter of my prairie thanks to the roving deer and rabbits. There are many 12-18 inch rose stems growing everywhere in my prairie, but since my wild roses only blossom on old wood, we no longer see any flowers. (I believe my wild roses are called Prickly Wild Rose (Rosa aciculris). Store-bought repellents typically aren’t strong enough to be thoroughly effective. Mix your own. Apply daily or at least as often as you can. Spray the perimeter of your property. 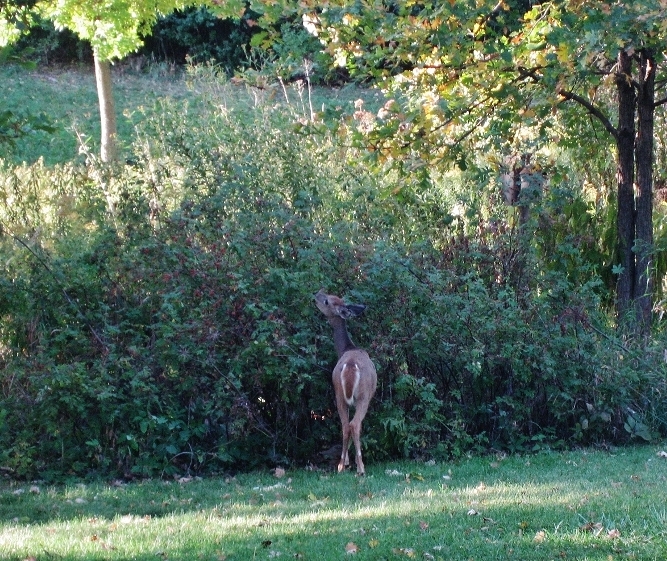 It reminds deer the rest of the property is off-limits. Alter their trails across your property. Make it difficult for them to follow the same route. Research deer resistant plants for your area. What works in Ohio, for example, may not work in Wisconsin. “Strong-scented perennials like lavender and some herbs naturally repel deer, as do thorny plants…but there are no guarantees.” Deer are opportunists; they’ll eat what they can find. The most effective way to deter deer is to install a 9 foot fence. If that isn’t possible, install a dense hedge of evergreens or some equally dense deciduous shrub. I have been using heavy test monofilament fishing line around my bird feeder in the winter to deter deer. The theory is that deer cannot see it at night and when they approach the forbidden zone and press against the line, which is strong between steel fence posts, they won’t go any further because they don’t know how tall the obstacle is. There have been only a couple instances where a deer went through it. Thanks for sharing your deer deterrent strategy, Tim. Have a good 4th of July celebration! I have been told that laying a chicken wire fence on the ground (instead of erect) stops them because they don’t like the feeling of walking on it with their hooves. Deer feel like they could get “stuck” in the fence and go elsewhere. Seems reasonable. Thanks for the added suggestion, Toni.